Last month, I didn't blog very much. One of the reasons is that we were very busy opening up our very first branch library. 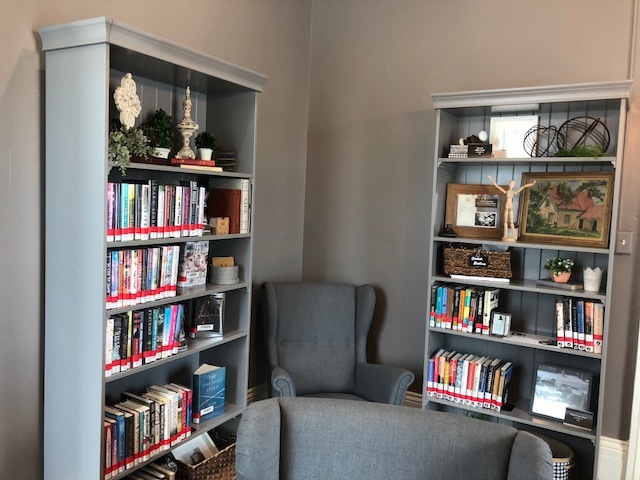 Our new Galena Digital Branch is located in a restored historic home and it's a very small and cozy space, so it has a VERY small physical collection, but it does have physical books there. 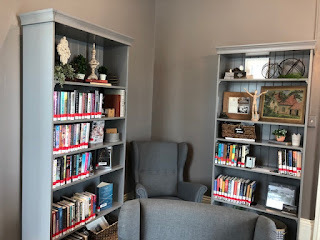 It also provides internet access, space for individuals to work or groups to meet, a play area for children, devices for check out and use within the library, and a Makerspace with a 3-D printer, laser etcher, sewing machines, and more. This has been a huge undertaking on the part of our director and it's her vision that's shaped this wonderful new space, providing a much-needed access point for the more rural parts of our county. Staff throughout the library have worked on parts of this branch and put in an amazing amount of effort to get everything ready. From a collection development standpoint, it's been a really interesting project to work on. We are learning every day about what folks want from this branch location and what's going to be our best bet with a physical collection up there. Here is our tiny Children's Area - two bookshelves, a small table and play items. We started with children's books. 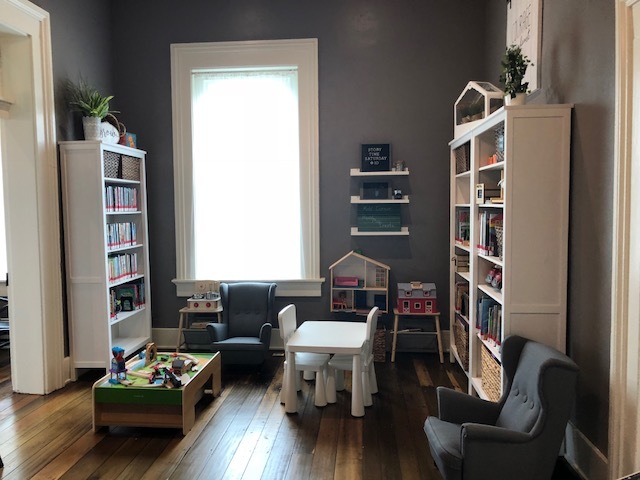 Knowing that young kids may not have the ability or level of access needed to utilize digital materials, we wanted to make sure to have physical books on the shelf for them. Board books, picture books, and easy readers are the most popular with our patrons up there so far. We also have a collection of children's and teen fiction and nonfiction. We got a great deal on a couple of large Junior Library Guild subscriptions which help ensure that there is always something brand new on the shelves up there. Our tiny Teen and Adult collections. Teen shelves on the left and adult on the right. Since we opened a couple of weeks ago, we have also debuted a new Lucky Duck collection of best sellers and popular books that have holds lists. We have a collection of Lucky Duck at the central library and a small collection of them at the Digital Branch to try to ensure that we also have some popular adult books on the shelves. A patron requested some large print to browse, so I sent a small collection of new large print books up there, as well. The print collection at the branch is almost entirely a floating collection. Everything is processed identically to the central library books and we float books up to live on Galena's shelves as needed. They get changed to a temporary collection in our ILS and we put red masking tape on the spines as a visual queue of where they go when they are returned. And patrons can request any circulating item to be delivered to the branch from our central library. Often we can provide 24-hour turnaround. And of course we are emphasizing the digital collection, as well. We provide ebooks, downloadable audiobooks, and downloadable media through Overdrive and Hoopla. We are also really utilizing our databases and I'm trying to determine what our most-needed digital resources are and provide training for staff. We don't have space for a physical collection of test prep materials, but staff can show patrons how to access Testing and Education Reference Center and Gale Courses for SAT practice, etc. I'm really excited that we have been able to open this new location and I'm really excited to see where it goes from here and how we can creatively fill the needs of our patrons with such limited physical space.